An extreme competitive environment is expected to be witnessed in the global sack kraft paper market in the near future, owing to the existence of a several players functioning in it across the globe, states an intelligence study by Transparency Market Research. The key players in the market, including Mondi, KapStone Paper and Packaging Corp., and BillerudKorsnas AB collectively accounted for 15.7% share of the total market in 2015. In order to maintain a leading position in the global market, the leading players present in the worldwide sack kraft paper market are focusing on new product development and research activities to enhance their market presence worldwide. Additionally, the development of the product range is expected to contribute tremendously towards the development of the overall market. 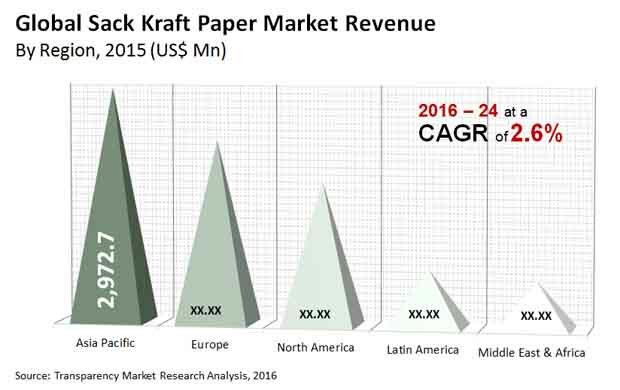 According to the market intelligence study by TMR, the worldwide sack kraft paper market is likely to reach US$10.5 bn by 2024. This market is likely to register a healthy 2.60% CAGR from 2016 to 2024. From a regional point of view, Asia Pacific and the Middle East and Africa are predicted to witness progressive growth over the approaching years, states a TMR analyst. As per the study, these regions are expected to collectively register a 3.40% CAGR from 2016 to 2024 on the basis of revenue. The rapid growth of the Middle East and Africa and Asia Pacific can be ascribed to the significant rise in the construction activities and the increasing demand for cement and other building materials. North America and Europe, on the other hand, are expected to experience a lethargic growth in the next few years, as these regions are considered as mature markets. In terms of end use, the global market for sack kraft paper has been classified into food, pet food, chemicals, animal feed, and cement and building materials. Among these, the segment for cement and building materials is likely to lead the global sack kraft paper market. This segment is estimated to register a 2.20% CAGR from 2016 to 2024, thanks to the rising construction activities around the world. The demand for sack kraft paper for cement and building materials is projected to rise substantially in Asia Pacific in the next few years. The rising environmental concerns related to the use of plastics has resulted in a high demand for development of sustainable products. This is anticipated to augment the growth of the sack kraft paper market in the forecast period. The expansion of the application base and the sustainability offered by sack kraft paper are likely to propel the whole market. Moreover, the tremendously growing demand from the cement industry around the world is predicted to offer lucrative opportunities for leading players operating in the sack kraft paper market worldwide. Furthermore, the ban on plastic in several nations and the increasing level of pollution are the vital factors projected to boost the use of sack kraft paper market in the upcoming years. The global sack kraft paper market is projected to experience some growth barriers in the next few years, due to which the growth of the market is likely to be hampered. The changing cost of raw materials is one of the key factors anticipated to curtail the growth of the market. However, as sack kraft paper are considered as biodegradable, governments worldwide are encouraging its use, which is estimated to supplement the development of the sack kraft paper market worldwide.